Solid State Logic was founded in 1969 by the late Colin Sanders CBE. The company’s first products were switching systems for pipe organs which used FET switching and multiplexed communication between the keyboard and the electro-mechanics of the pipes. These replaced expensive, cumbersome and unreliable arrays of relays and solenoids and thick bundles of interconnecting cables. Colin coined the phrase Solid State Logic as a descriptor. Colin started Acorn Studios in the village of Stonesfield, Oxfordshire, where he lived, and made – and used – consoles for it. By 1976 he had built the first A Series console; a total of two were made and sold. Always committed to improving things, the console was reinvented as the SL 4000 B Series, the first of which was made in 1976. Six B Series consoles were built and the beginnings of SSL’s international business commenced as customers for these included studios in the US (Producers Color), Denmark (Tocano) and Germany (Country Lane) as well as Virgin’s Townhouse Studios in London. The big breakthrough came with the introduction of the SL 4000 E Series in 1979, the console which transformed the music recording industry and whose variants, the SL 4000 G Series, 6000, 8000, 9000J and 9000K dominated the professional recording studio industry for two decades. The company grew rapidly during the 80’s initially from its custom built HQ in Stonesfield. 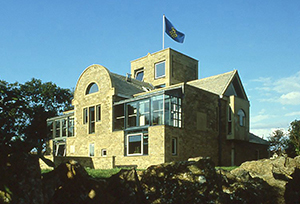 In 1986 the company moved its HQ to Begbroke Manor where it added a 4,000m2 manufacturing facility which opened in 1988, enabling SSL to consolidate its operations from three separate industrial units in nearby Witney. In 1988 the company became part of UEI plc, a technology group that included Quantel, Cosworth Engines, Link Analytical and Cabletime. A year later UEI was acquired by Carlton Television and SSL became part of its technology group alongside Quantel and Technicolor. In 1999 the company was sold to 3i in an IBO. SSL is now owned by the musician Peter Gabriel whose Real World Studios has been a customer for many years.